via bigpipe support channels but they only offer non static IP's (free). http://bigpipe.co.nz/#/support or pm one of the bigpipe peeps here :) im sure they will be glad to help you. Ok, I've just discovered more serious problem. I have a paid VPN account in US. I can't connect with PPTP to it anymore. L2TP however works fine. PPTP used to always work before. It could be the VPN provider issue however - I can't check. Please only request an IP if you actually really need one (aka, can't go without having one at all) - remember you're getting free internet until the end of March and they'll sort these little kinks as they come. I believe they only have a /24 subnet range to work with so grabbing a public IP just because you're unable to get uTorrent connectible is a poor excuse in comparison to people like me who run a dev web server along with off-site backups and need the ability for customers to test their sites etc in a non-production environment. sure I could have lived without a public IP and I was quite happy to until they got the kinks sorted but it's something I use on a daily occurrence for things other than torrents. I'm little bit confused. What's the difference between static IP and the public free ip? Does it mean that I will have no external NAT but the address will be assigned dynamically? You'll get a random address with each modem reboot, but you don't need a public IP at all so please read my post above and don't get one. Leave it for the people who actually need it. I believe they only have a /24 subnet range to work with so grabbing a public IP just because you're unable to get uTorrent connectible is a poor excuse in comparison to people like me who run a dev web server along with off-site backups and need the ability for customers to test their sites etc in a non-production environment. Look, if you need an internet for your business purposes why don't you buy a business service and then claim back expenses, gst etc??? I thought that this is mainly a residential plan for home users like me who just use it for personal not for business. I use torrents, vpn and other just for fun, not money. But why do you believe that your business needs are more important than mine? Just because you are making money on it and I'm not? Anyway, this is way off topic now. I guess using customers was the incorrect word here. An update for those of you who have been trying to get TVNZ working. We have now got word back from TVNZ and Brightcove and the issue has been fixed. So if anybody wants to have a go and report back, that would be great. BigPipeNZ: An update for those of you who have been trying to get TVNZ working. 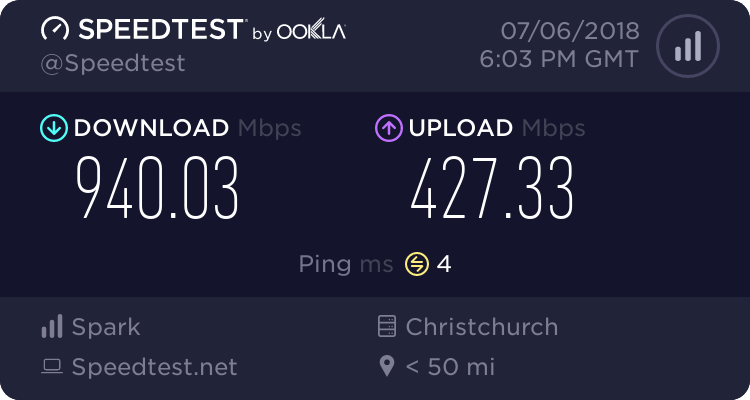 It seems to be working well on VDSL2 in Wellington on 1500k streams. I am on a "public" ip address. Last time I tried to access TVNZ I was not on a public address. spoonboy: Ok, I've just discovered more serious problem. I have a paid VPN account in US. I can't connect with PPTP to it anymore. L2TP however works fine. PPTP used to always work before. It could be the VPN provider issue however - I can't check. L2TP is much more secure than PPTP - I always use L2TP if given the choice. 28/9mbps down/up on VDSL, which is was I was expecting at about 900m distance from cabinet. Ok firstly, great work being on time, installed when big pipe said it would be, and without any fuss. This is of great importance to us the consumer. DSL stats are on par with others in the area. Transfer speed is generally ok.
Quickflix streams well, cached international downloads are fast(tested with elder scrolls online beta). SSH transfers(sftp) however seems a little slow, with around 450KB/sec average. Another isp which I wont name was tested to the same ssh server and had speeds of around 750KB/sec, which while not that much faster would certainly shave some transfer time from backups. Just for comparison the eso download was at around 1.6MB/sec. Gaming seems good with ping times in dota 2 on par with other isps. Unusual for me to see traceroutes incorporating private ip ranges, which is because of cg-nat which so far hasn't hampered connectivity.